"Comes with a stylus wand that lets you operate your iPad without the need to touch the screen with messy fingers." "Ideal for the kitchen since you can mount it on a kitchen cabinet or the wall, bringing the iPad to eye level." "Mounts under a kitchen cabinet or to the wall, and two mounting bases are included so it can be moved around the kitchen." "Thin, protective film that is crystal-clear and thin enough so the touchscreen can still be used. The sleeve is secured with a resealable strip." "Mount is affixed to the fridge or other smooth, flat vertical surface...with 3M Command strips, which leave no residue." "Bamboo cutting board with an integrated iPad stand in the back...a removable clear screen shield protects the iPad from splatters." Designed especially for use in the kitchen, Belkin's Chef Stand is compatible with most cases and can be adjusted to two different angles. The rubber base keeps it from slipping. 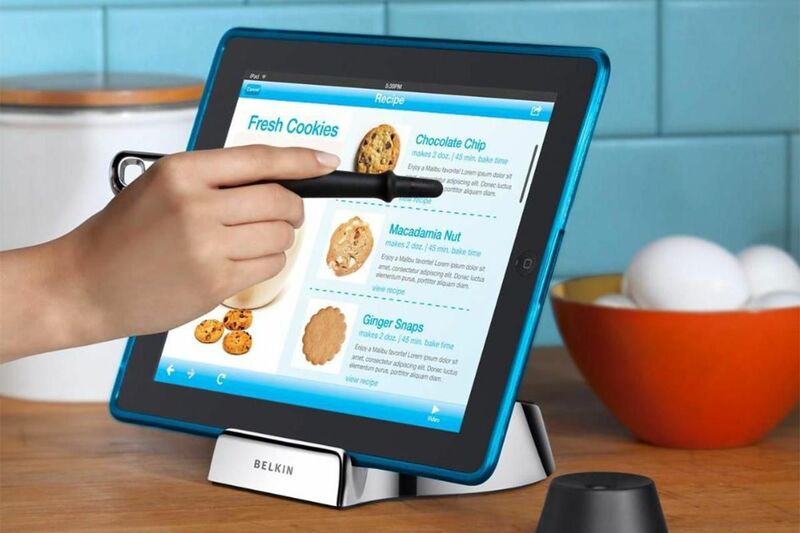 The Chef Stand comes with a stylus wand that lets you operate your iPad without the need to touch the screen with messy fingers, and the wand sits in its own stand when not in use. The magnetic tip navigates the touchscreen and can even be used to wake up an iPad. Everything can be hand washed. The RingO system is a ​mounting system that you can use anywhere, to attach your iPad to anything: the wall, a cabinet, the car or a stand. 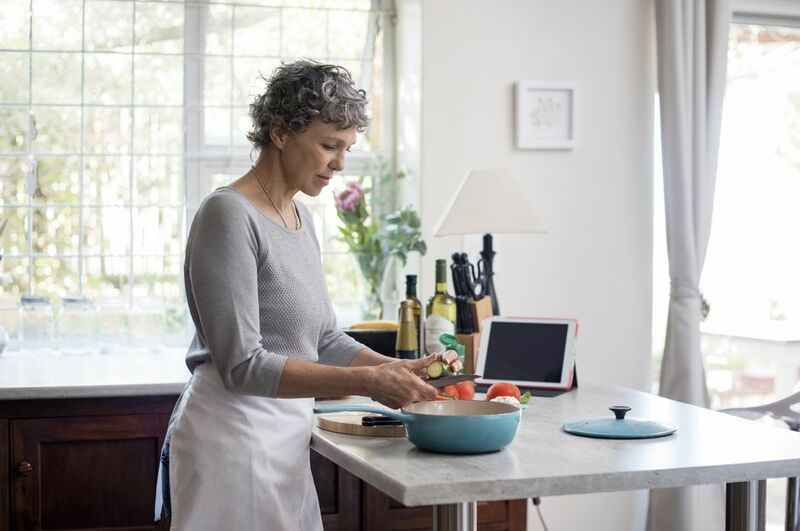 It's ideal for the kitchen since you can mount it on a kitchen cabinet or the wall, bringing the iPad to eye level and safely away from a messy countertop or hot stove, and on the mount it can rotate 360˚ and unclip easily. The starter pack includes one tablet holder and one wall mount. Years ago, space-minded home cooks installed under-cabinet cookbook stands that held their cookbooks at perfect eye level, while freeing up counter space. Today, with many people looking up favorite recipes online rather than through the pages of a book, a cabinet mount for an iPad makes much more sense. This version can be used with any tablet that measures between 6 to 8.5 inches, including any current iPad and iPad Mini model, as well as Kindles, Nexus and Galaxy Tab. It mounts under a kitchen cabinet or to the wall, and two mounting bases are included so it can be moved around the kitchen. The aluminum holder retracts, adjusts, and rotates so that you can tilt your device to the perfect viewing angle. And when it's not mounted on the wall or cabinet, the stand has legs that extend to make a secure tabletop iPad stand. A must for keeping your iPad pristine in a messy kitchen, disposable Chef Sleeves are made of a thin, protective film that is crystal-clear and thin enough so the touchscreen can still be used. The sleeve is secured with a resealable strip so it can be used multiple times. Chef Sleeves are available in boxes of 25 and the package doubles as a stand. When you're done with the sleeve, it's recyclable. No hardware or installation is required to use this refrigerator mount designed for the iPad 2. The mount is affixed to the fridge — or other smooth, flat vertical surface, like a cabinet or a wall — with 3M Command strips, which leave no residue behind when removed. The iPad's own magnets hold it in place within the mount. This multipurpose product features a bamboo cutting board with an integrated iPad stand in the back, perfect for following a recipe or watching a technique video as you work. A removable clear screen shield protects the iPad from splatters, and there are storage slots on the side of the cutting board for up to 8 knives. All iPad models, including iPad Air and iPad Mini, are compatible with this cutting board holder. The generously sized cutting board measures around 15.5 by 13 inches.